As a Public Domain state, Arizona uses a rectangular surveying system called the Public Land Survey System (PLSS). It was originally set forth by an ordinance passed by the Continental Congress in 1785. The ordinance provides for a rectangular grid of townships that are approximately 6 miles square. Each township is further subdivided into 36 sections, each approximately 1 mile square. As a result of convergence of meridians and errors in field work, the boundaries of townships and sections are not exact. The original Arizona cadastral survey "plats" were done by what was then called the General Land Office (GLO) in the late 1800's and early 1900's. General Land Office Survey Maps show those original maps for the entire state of Arizona. The approximately 27 square mile Canoa Land Grant area was not included in the original survey and is not part of the of the Public Land Survey System. The original General Land Office Survey Maps clearly show the exclusion of the Canoa Land Grant in Township 18 Range 13 East, Township 18 Range 14 East, and Townshp 19 Range 13 East. You can also see the Canoa Land Grant as the long, angled rectanglular area in the southern Pima County border in the eastern part of the county in the township numbering map below. Even though the survey did not survey or define sections in the Canoa Land Grant area our Pima County GIS system shows sections in the Canoa Land Grant area as they might have been had the Canoa Land Grant area been part of the survey. These fictitious Canoa Land Grant area "sections" enable us to store and manage GIS data throughout Pima County in a consistent manner. Townships are located and numbered starting from a reference point defined by a baseline and a principal meridian identified for each survey district. There are two survey districts in Arizona: the Gila and Salt River, and Navajo. The Navajo survey district is relatively small comprising the northeast corner of Arizona and the northwest corner of New Mexico. Most of Arizona, including Pima County, makes up the Gila and Salt River survey district. The townships of a survey district are numbered meridionally into ranges and latitudinally into tiers with respect to the principal meridian and the baseline of the survey district. Instead of tier, the word township is generally used. The townships (tiers) are numbered as north and south of the baseline. Townships in Pima County number from Township 11 South to Township 23 South. Since all townships in Pima County are south of the baseline (Baseline Road in the metropolitan Phoenix area), the "south" designation is sometimes omitted when referring to townships in Pima County. The principal meridian of the Gila and Salt River survey district divides Pima County. About a quarter of the county is west of the principal meridian and about three-quarters is east of the principal meridian. Each township has a range number assigned to it based on its position east or west of the principal meridian. Ranges in Pima County number from Range 10 West to Range 18 East. Since both east and west ranges are found in Pima County, a township's range designation must include "East" or "West" to uniquely identify the township. This numbering method allows any township in the county to be located by its township (tier) and range. For example, downtown Tucson is in Township 14 South, Range 13 East. This is often abbreviated as T14S R13E, 14S13E, 1413E, or even E1413. Computer file names for individual townships often use the shortest possible form. Each township, approximately 6 miles square, is divided into 36 approximately one-mile-square sections. Provisions of the original 1785 ordinance stipulate that "The sections shall be numbered, respectively, beginning with number one in the northeast section and proceeding west and east alternately through the township, with progressive numbers, till the thirtysixth be completed." Thus, section numbers are from 1 to 36 as illustrated in the diagram below. The yellow area shows a single township and its 36 one-mile-square sections. Other colors show section numbering in adjoining townships. Section diagram is courtesy of Infobahn Outfitters. 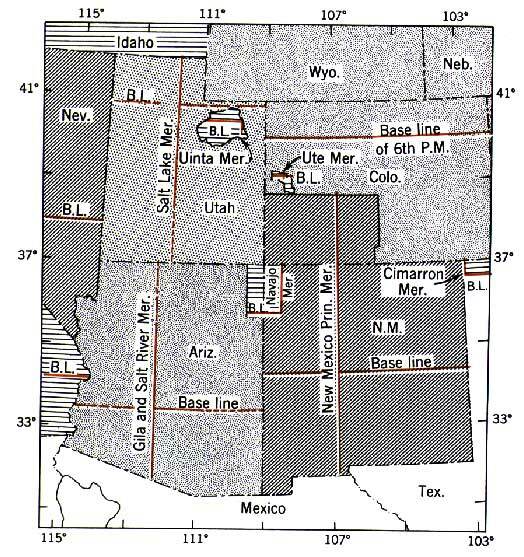 For more information, check out a description provided by Infobahn Outfitters explaining Legal Land Descriptions in the USA which includes a section on Legal Land Descriptions in the Federal Township and Range System as used in Public Domain states, including Arizona. For even more detailed information on the Public Land Survey System, see Page 321: Appendix 3.11.A, Background Information on the Public Land Survey System within Part 3, Attribute Coding, Standards for Digital Line Graphs National Mapping Program Technical Instructions. This is part of the Standards for Digital Line Graphs (DLG-3) document maintained by the U.S. Geological Survey.